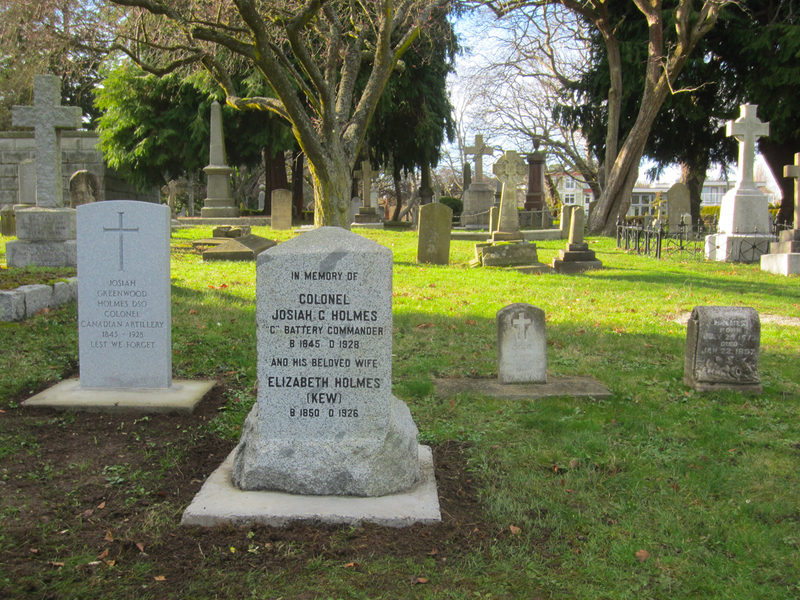 The monument for Lieutenant-Colonel Josiah Greenwood Holmes and his wife Elizabeth Holmes was placed in Ross Bay Cemetery on Nov. 10, 2018. A solid granite stone survey marker once cast aside by construction workers has been crafted into a monument honoring a pioneer Deputy Adjutant General of the Canadian Army Permanent Force, and former District Officer Commanding, stationed on the Pacific Coast where he was responsible for the defence works and School of Artillery training of the local Militia forces, originating in 1888. The monument for Lieutenant-Colonel Josiah Greenwood Holmes and his wife Elizabeth Holmes was placed in Ross Bay Cemetery on Nov. 10, 2018, following remembrance efforts by his descendants. The granite survey marker was originally installed marking the site of Work Point Barracks in the late 1880s. But it was left behind by work crews after a demolition project of the “Work Point Barracks Officers Mess and Quarters” in 2006. Local historian and veteran Signalman (Retired) Jack Bates, who operates the Organization for Preservation of Canadian Military Heritage (OPCMH), facilitated the project. He says the idea for the monument itself came from Esquimalt residents Scott Lee and his wife Carol, who is the great-granddaughter of Lt. Col. J.G. Holmes. The Lee family and Bates were onsite when contractors removed the survey stone and carted it away in a flatbed truck in June of 2017. “This process is helping myself and other family members rediscover our military heritage and someone who played such an important role in the history of Victoria and Canada,” said Carol Lee. But before they could move forward with converting the survey marker to a monument, Bates says the project first needed to meet approval from the Department of National Defence (DND) and Ross Bay Cemetery. The Lee family also paid for the monument with assistance from Veterans Affairs Canada’s (VAC) non-profit charity, the Last Post Fund. Lt. Col. J. G. Holmes was born May 28, 1845, in St. Catharines (Upper Canada). 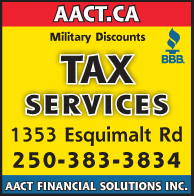 A graduate of Royal Military College, he worked as an adjutant (administrator to a senior officer) of A Battery in Ontario from 1872 until his promotion to the Commander of the Victoria Garrison Artillery known as ‘C Battery’. “C” Battery, located in Victoria in 1887, was established to shore up coastal defences and protect Victoria and Esquimalt harbours from possible attacks by foreign powers and also to oversee the formation and training of a militia force in the years following Confederation. The new monument is located on the Holmes family plot at Ross Bay Cemetery and next to a new headstone for Lt. Col. J.G. 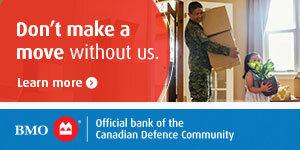 Holmes and his wife, paid for by funding through Veterans Affairs Canada’s (VAC) non-profit Last Post Fund. Bates says there was no headstone ever found for Lt. Col. Holmes anywhere in Victoria, so this new headstone helps pay proper tribute to Holmes and his wife.